Leadership is all about influence. Tunde Hunpe represents a leader whose tremendous influence as impacted on his immediate environment. It is not the position that makes the leader; it is the leader that makes the position. Tunde Hunpe’s greatness as a leader was manifested right from the beginning of his remarkable career. Accolades followed accolades. 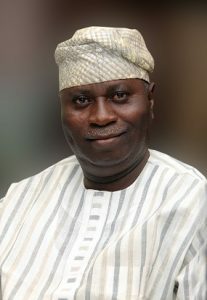 His quest for higher education began at Lagos State University where he read History and International Relations. He was visibly encouraged by the lecturers in the Department to go for advanced Degrees. This led him to enroll for his Master Degree in International Relations and Strategic Studies in the same Department. Education is a great catalyst to development. This was recognized long ago by him. Already, he has two Master Degree, the second one is in History and Diplomacy. Tunde Hunpe has one philosophy-Life-long learning. He is an avid reader who believes in knowing a little about a lot. That is why he holds membership of many professional associations. – Fellow of the Institute of Certified Public Administrator. Mr. Hunpe, an humble man who has served in several position in Lagos State University between 1988 and 2011 amongst which are Head of Protocol 2004-June 2006; Assistant Registrar (Acad. Staff Estab.) June 2006-September 2007. Assistant Registrar/Alumni Relations Officer Sept. 2007-April 2008, Senior Assistant Registrar (Exams and Records) April 2008-Aug 2008 and Senior Assistant Registrar/Admin. Secretary – August 2008 to June 2011. He also earn his promotion in LASU to the post of Principal Assistant Registrar which was due to him before his appointment as Special Adviser to the Governor of Lagos State on Rural Development in July 2011. – Chairman, Badagry Division Indigeneship Verification Committee. In appreciation of his hard work and promotion of true democratic setting in Nigeria and beyond. He was recently elected professional Fellow of the Civilian Institute of Democratic Administration of Ghana (FCIDA-Ghana) at Tema, Republic of Ghana in August 2012. He was also awarded the Fellow of the Institute of Certified Public Administrators recently based on his professional background a respected University Administrator. Tunde Hunpe worked and has continued to work selflessly to position Lagos State University to one of the topmost Universities in Africa and indeed, the world. He works very well with little or no supervision. He also uses his leadership skill to inspire his subordinates and he has succeeded in developing the leadership potentials in them. He has great respect for the authority and he has successfully guarded his integrity since he was born. It is often said that integrity, once lost, can never be regained. He is a man of integrity. His word is his bond. In this information age, learning is the key to excellence. Although he has academic degree and professional qualifications, he still pursues workshops and training with vigour. It was organized by the American Association of University Administrators and was titled; Leadership and Accountability, Producing Result, Inspiring Trust. v 3-day conference organized by the Nigeria Institute of Public Relations in conjunction with Trainlink Association Limited. It was titled Protocol Function and Corporate Efficiency. v Course organized by Resource Consult at the Administrative Staff College of Nigeria (ASCON); titled Personal Association and Administrative Officer Proficiency. v Nigeria Institute of Public Relations at Hill Station Hotel Jos, titled Toward Effective Protocol Administrators in the Public Sectors Organization. v The Jonal Institute for resource Development at National Library Conference Hall, Kaduna; titled Communication Skill and Public Relations. His Research works received commendations from lecturer in the Department of History, Lagos State University. His Master’s thesis was centered on National security: A Nigeria case study while his Bachelors work was x-rayed on the Nigeria-Benin Economic Relations since Independence. Despite his tight work schedule he still finds time to socialize. He is a member of the Badagry Development Council (BDC), Ogu Central Forum (OCFN), Badagry Foundation, Ajara Topa Elite Club and a host of others. Tunde Hunpe has wealth of political experience. He is a staunch supporter of Asiwaju Bola Ahmed Tinubu and his programmes. His political antecedents were duly recognized by the leaders and elders in Badagry. He is an investor in people. He is widely travelled and he is an experienced administrator as well as a political strategist. He is also an avid reader and he pays immaculate attention to details. Having said all, Tunde Hunpe remains a giant surrounded by giants. Those whom he invested in. His reputation survived his work and he would be treasured continually as a leadership Icon.